I promised we’d be returning to exciting things like YA novels and vegan recipes this week. I’ll keep my promise about the YA novel tomorrow, but this recipe? Vegan it is not. Actually, when three of the six ingredients are cheese, eggs, and bacon, I think we can all rest assured that this is about as far from vegan as you can get. I’m slowly accumulating a few recipes that I can make at a moment’s notice that don’t require a lot of unusual ingredients or need things to defrost. This is my newest and most favorite. I actually don’t even love bacon, eggs, or pasta, but when I saw this recipe in Garlic and Sapphires (no picture!) I thought. . .hmm, this could be tasty. And then it was better than I’d even imagined. I made it three times in 24 hours (dinner, lunch, dinner). I love it for lunch with a piece of fruit, but add a salad and you’ve got dinner. Done. Bring a pot of water to boil. When it reaches a boil, toss in your angel hair (I break mine into quarters because I find it easier to eat). While your pasta cooks, start cooking your bacon bits. After it's starting to fry up a bit, add the garlic and let it cook another couple of minutes, stirring frequently so the garlic doesn't burn. If your bacon is extremely fatty, you can drain a bit of the grease, but I never have. I just leave it all in there (because it's delicious). If it's starting to get too crispy (you don't want it fully fully cooked), remove the pan from the stove top. Meanwhile, beat the eggs in a bowl big enough to hold all of your pasta. Add a couple of grinds of pepper. 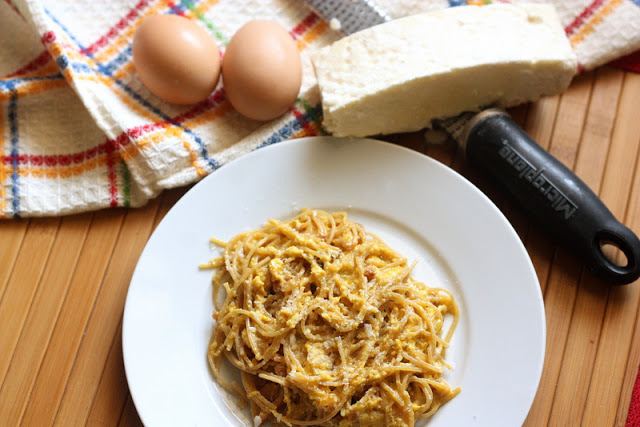 When your pasta is done, drain it and immediately pour it into the bowl with eggs and mix thoroughly to coat the pasta. Pour the egg/pasta mixture into the bacon pan (over medium-low heat), sprinkle the Parmesan on top, and cook, stirring constantly for about 90 seconds, until the eggs start to set. This is basically how Macaroni Grill does their carbonara, which is not actually carbonara but is interesting and tasty all the same! And NOW I think my email is attached. Ha! I make a similar dish (other than a slightly different cooking method the main difference is the addition of some green peas for color and a bit of healthiness) and it is always a hit. But it has been a while. Maybe next week's menus? I make something similar as well. My recipe uses 2 eggs, and calls for cream or half & half. I usually end up using evaporated milk because I always have it on hand and it works great. This is one of my 3 yr olds favorite meals. We call it spaghetti carbonara. This is one of my husbands very favorites! I've seen lots of carbonara recipes but it's the bacon that always makes me doubt the recipe. I like crunchy bacon, not soft, chewy bacon. When a recipe calls for cooked bacon to mix in it seems like the bacon develops a weird texture. Or maybe it's just me…..? My mom used to make this when i was a kid, and i make it for my kids. It is one of our favorites. We use spicy ground italian sausage instead of bacon which gives it lots of fantastic flavor. So I definitely just made your recipe for lunch today, using rice noodles (since the hubby's gluten-intolerant). Delicious! Thanks for the easy and yummy recipe! I don't like eggs but make a bacon penne bake that is fabulous. For the crispy bacon lovers here, take the bacon out when it is crispy, toss your egg-noodle mix in the grease for 90 seconds and then GARNISH with a handful of bacon. The grease will give the pasta the flavor and the you can still keep your crispy bacon. Carbonara is super easy, love it! I make it with some peas thrown in. Spaghetti Carbonara will always remind me of my honeymoon which makes it one of my very favorite foods. Oh I love carbonara so much! The convenience of not having to the grocery store for this dish, you can’t beat it.